In the first quarter, the Lakers curve is pretty much a straight 45 degree line. Everything they put up went in. 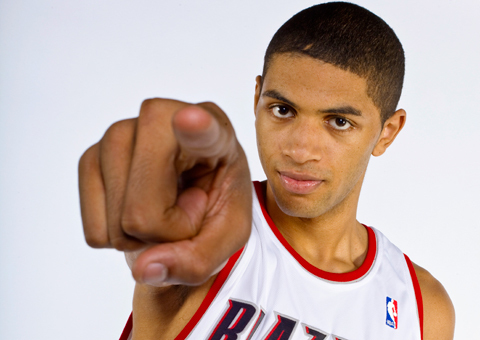 They scored 37 points (13 from Pau Gasol) and led by 13. In the early part of the 2nd Quarter, the Lakers inexplicably got even hotter. Their curve spikes upward at a point when Wolves fans at Target Center were desperate for some regression to the mean. They made 7 of their first 8 field goal attempts to open the 2nd Quarter. 4 of those were 3-pointers. With 6 minutes to play in the first half, the Lakers held a 61-32, 29-point, almost-doubling-up-the-opposition lead. 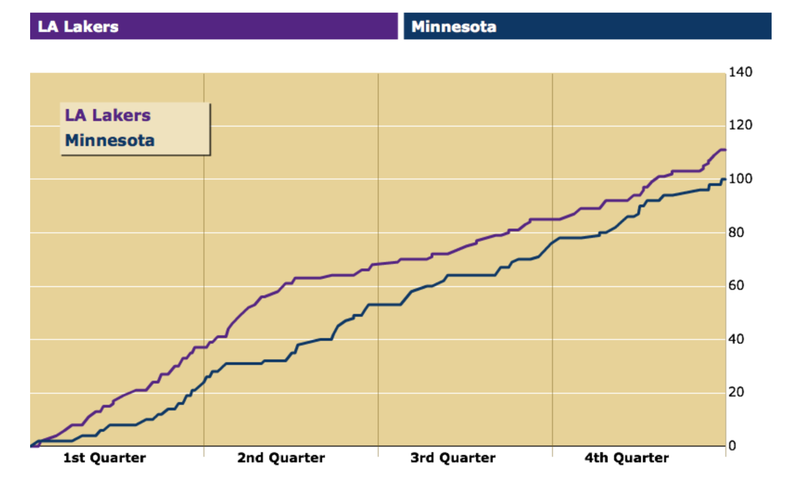 On the graph, you notice two things begin midway through the 2nd Quarter: One, the Lakers curve flattens out. Finally. Two, the Wolves gets steeper, after a sluggish start to the 2nd Quarter. Their shots — including some much-needed three-pointers — began to fall. The Wolves closed the first half on a 21-7 run, cutting the halftime deficit to a troubling but not insurmountable 15 points. Ricky Rubio was key to that stretch, blending his usual feisty defense with some scoring (2 nifty layups, 1 dribble jumper) and capping off a fun stretch with a behind-the-back dime to D-Thrill for a huge dunk. Things got even closer in the 2nd Half, after Adelman committed to a zone defense that gave the Lakers fits. 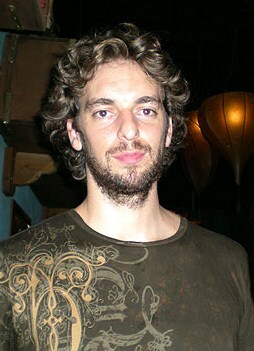 Until they realized how Pau Gasol was born to be the hub of a zone offense, that is. Once Pau started filling the gaps, and his teammates started hitting him in playmaking spots, the Wolves struggled to defend. But they did cut it to 4 midway through the 4th Quarter, which is an admirable comeback attempt from the 29-point deficit earlier in the game. Moral victories and all that. Orlando Trades Dwight: Did they get enough in return? So, I just discovered Wolves Rubes, a new Timberwolves site that already has some interesting content up, like this post breaking down Pau Gasol trade rumors.